We all dread the day that our favorite piece of hardware becomes so old that spare parts are no longer available for it, something about facing that mechanical mortality sends a little shiver up the hacker’s spine. But on the other hand, the day you can’t get replacement hardware is also the same day you have a valid excuse to make your own parts. That’s the situation [Jonathan] found himself in when the choke lever for his Suzuki motorcycle broke. 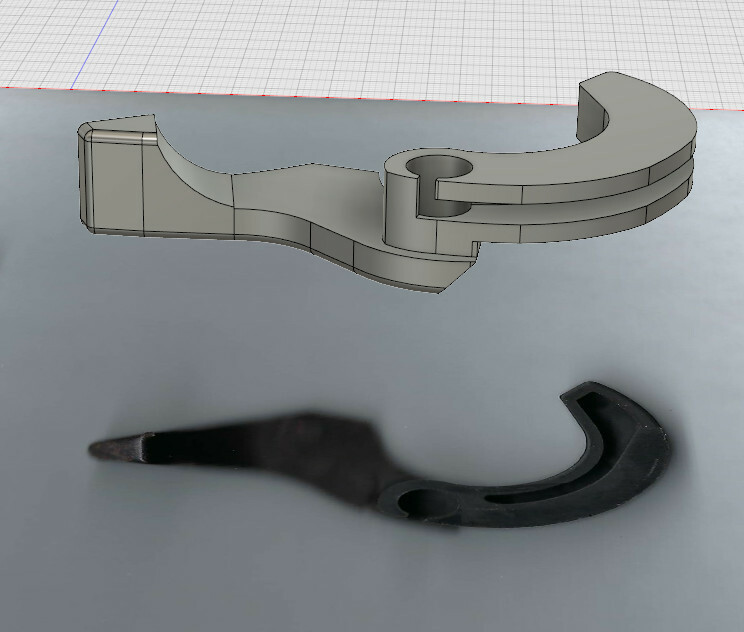 New parts aren’t made for his bike anymore, which gave him the opportunity to fire up Fusion 360 and see if he couldn’t design a replacement using a 2D scan of what was left of the original part. [Jonathan] put the original part on his flatbed scanner as well one of his credit cards to use for a reference point to scale the image when he imported it into Fusion 360. Using a 2D scanner to get a jump-start on your 3D model is a neat trick when working on replacement parts, and one we don’t see as much as you might think. A proper 3D scanner is cool and all, but certainly not required when replicating hardware like this. The choke lever is a rather complex shape, one of those geometries that doesn’t really have a good printing orientation because there are overhangs all over the place. That combined with the fact that [Jonathan] printed at .3mm layer height for speed gives the final part an admittedly rough look, but it works. The part was supposed to be a prototype before he reprinted it at higher resolution and potentially with a stronger material like PETG, but after two years the prototype is still installed and working fine. This isn’t the first time we’ve seen a “temporary” 3D printed part become a long-term solution. Porsche is starting to use 3D printing for some rare replacement parts too. If this design proves weird to print with its many parallel overhangs and such, you could always go with the pull-knob style choke. Shouldn’t be too tough to measure the pull of that thingie and design a bracket and knob to pull the cable the same distance. Now what I need to do is design some kind of linkage between my two Mikunis. I’m real tired of having to thumb the two choke paddles up and down in sync with each other to keep my engine alive. Wow! and I thought I had problems with the Hitachi carbs on my Virago! But at least you could get it to start! Aftermarket carbs can often be a masochistic pursuit. In the summer they are fine, but in the winter I gotta run it on choke for a while. I do love a good virago though! Looks like one from the 1970’s. Choke lever right by the throttle. Kick start only, on some models. You learned that little feathering with the throttle skill. I’m curious what year the Suzuki/patient is? How does anyone manage to design anything in Fusion 360? I’ve used CAD programs, Blender, OpenSCAD, etc and Fusion 360 just confuses the hell out of me. Ditto for the love affair the maker community has with what is a highly proprietary, locked-into-the-cloud, subscription-model software. Also, the way they organize the program files, at least on OS X, is infuriating. They force you to keep it in your task bar. It doesn’t go into the system Applications folder. It goes into a folder buried in your Library folder (which for most users is hidden), and the way they update it makes it impossible to drop an alias into your Applications folder; I’ve tried. Every time they (silently) deploy a new version, they do so into a new subfolder and then recreate the aliases and dock icon. And you can’t make an alias to the alias they create. And when you discover this, after removing the dock icon…there’s no easy way to undo the problem. Yeah the shortcut thing is annoying. It adds a shortcut to Windows desktop every time as well. I’m gonna schedule a batch script to auto delete it. Autodesk certainly receives a lot of low production-value attention that reeks of sponsored content, but maybe people still get excited over repacked 35 year old software.